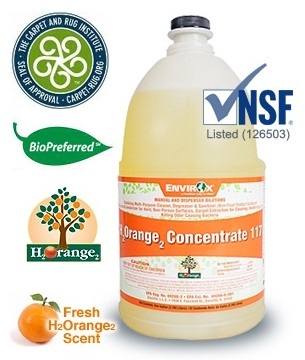 SSS/EnvirOx H2Orange2 Concentrate 117, Multi-Purpose Cleaner/Degreaser/Sanitizer, 4/1 Gal. 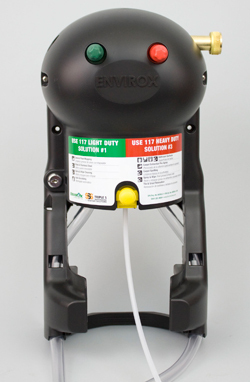 One product, two dilutions, 95% of your cleaning needs. From urinals to mirrors, from kitchen grease to carpet care, H2Orange2 Concentrate 117 does the job without damaging you or your facility. H2Orange2 Concentrate 117 ia EPA registered to kill 99.99% of common bacteria and 99.9% of specified viruses, including Hepatitis B. Choose H2Orange2 Concentrate 117 for Fresh Orange Scent. It's the professional choice in schools, amusement parks, healthcare facilities, government buildings, professional complexes, animal hospitals, shopping centers, and well-known landmarks. EPA Registered, NSF & Green Seal Certified. (NOT FOR SALE IN CALIFORNIA).